Katerina Nikolakopoulou is a psychologist located in Amsterdam, specialised in sleep therapy. 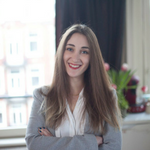 She is a member of the Nederlands Instituut van Psychologen (NIP) and has a BSc degree in Psychology from the Aristotle University of Thessaloniki in Greece and an MSc in Cognitive Neuropsychology by the Vrije Universiteit van Amsterdam. Katerina runs her own private psychology practice and collaborates for clinical purposes with the Boerhaave sleep clinic together with the neurologist and somnologist Dr Hans Hamburger. In addition, she holds a lecturer’s position at the Webster Campus in Leiden where she teaches undergraduate students. She has strong experience in sleep therapy, psychology and research and helps people who are looking for professional support to deal with every-day psychological challenges and sleep related difficulties. She also focuses on educating people on sleep and sleep hygiene since prioritising sleep has been proven to be crucial for optimal performance and emotional health.